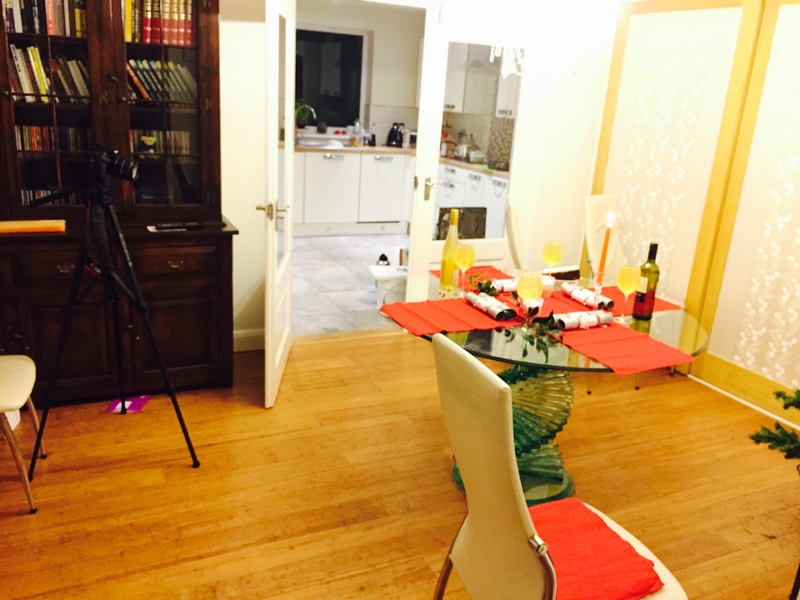 There were a few things I immediately knew I had to do in this video, Firstly I needed to work out how to achieve the bokeh light effect, I needed to have a Christmas dinner, and show the manic Christmas shopping. 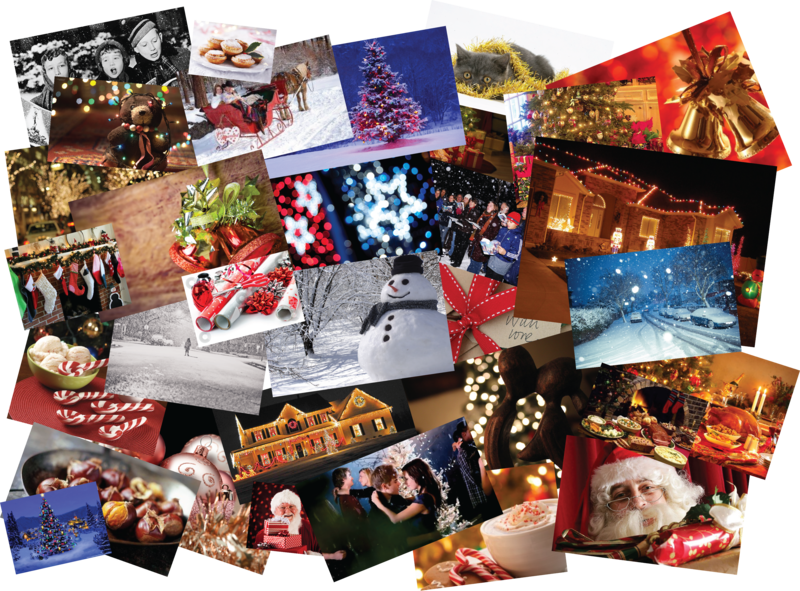 Based on this collage, I loosely created a storyboard based on a few ideas I had. – Switch on of the lights. 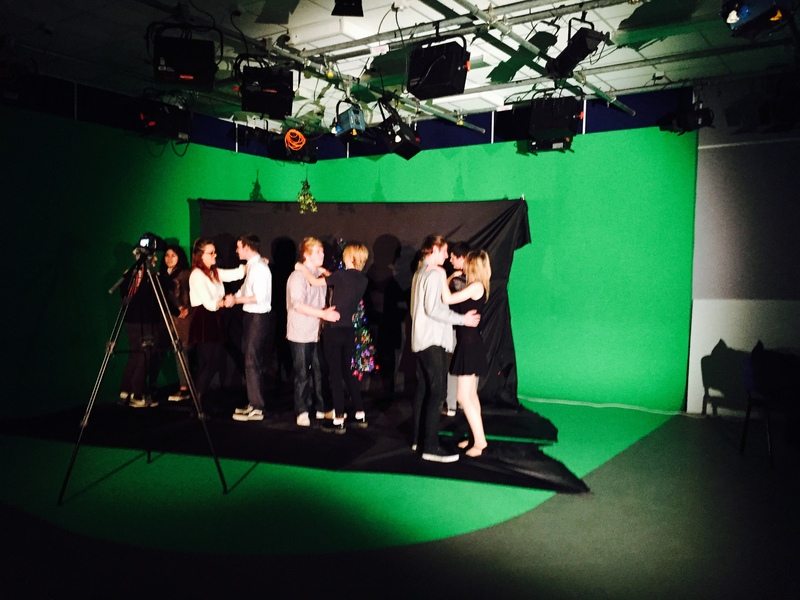 The romantic dance was the most challenging of all the scenes, firstly I needed actors so I pitched my idea to a class of drama students, I narrowed them down to 10 willing actors. 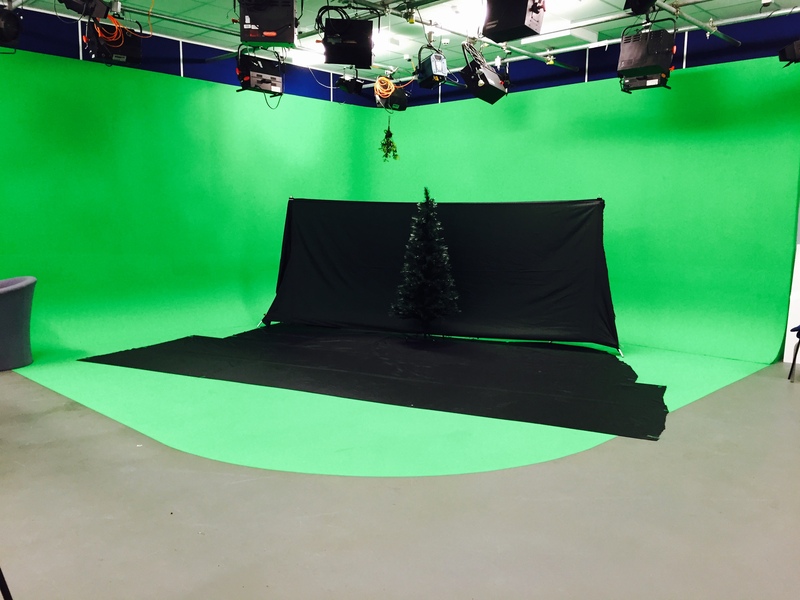 I decided to use the green screen room and set up black curtains in the background so the actors didn’t have green silhouettes around them, below you can see the set with black curtains, Christmas tree and mistletoe dangling from the ceiling. The picture below it is when the actors were dancing romantically, I turned out the studio lights and switched on 3 individual lights so that i had the perfect lighting on the camera. The post production of this was equally as difficult as I had to use Adobe After effects to learn new skills to correct the lighting of the shot and also key out the green in the background of some of the shots. The next key shot to get was the Christmas grotto, luckily I was able to get special permission to access the pen where the reindeer were kept, I stood inside with the owner and got some vital shots of the reindeer. 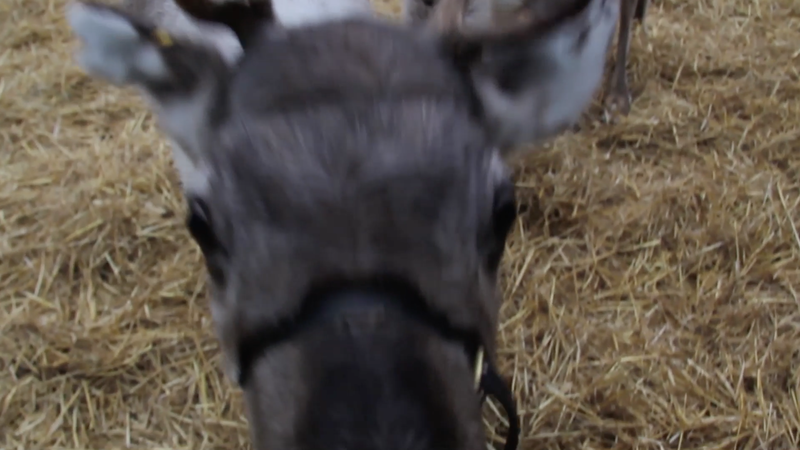 One shot I was keen to get was of the reindeer coming to the camera and being inquisitive about thew lens, I knew this would be a very difficult shot to get, we tried to tempt them with food but it didn’t work so well, but luckily just as I was ready to leave one of them came up and sniffed the lens. I believe this is the strongest shot in the video. The speeded up shoppers was a really easy and simple shot to get as basically all I did was set the camera up on the street and setting it to record for 10 minutes. Then in the post-production I set the footage to 1000% the original speed. Another shot I really wanted to get was the Christmas lights being switched on by the mayor of hull. I made a call to the council and was given permission to the balcony provided I had public liability insurance, this is something that I didn’t have so unfortunately wasn’t able to get the shot I wanted but after a bit of research, I realised it might have been easier if I was a member of the nation union of journalists, this is something I am considering becoming a member of should this sort of situation arise in the future, I will have some form of pass. With all of my footage filmed, only thing left to do was to edit the video together. I realised that my previous choice of song (The Shins – Wonderful Christmastime) wasn’t going to work for the footage I had collected. The reason being is the feel I wanted from my video was something that was upbeat and fast cut, yet still reasonably slow for the slow romantic dance and kissing scene. After hours of searching for the right song I had decided all the traditional Christmas songs wouldn’t work, I started looking into classical music, something I would be able to manipulate if need be. I found the “Dance of the sugar plum fairy” so I looked for a Christmas version, one did exist but it had sound effects over the top, I continued to look at other versions of the song and I found the version by Pentatonix which starts very well, has a section in the middle which I deemed appropriate for the reindeer, and then goes slow towards the end.